To create a new list, tap the ‘+’ button. 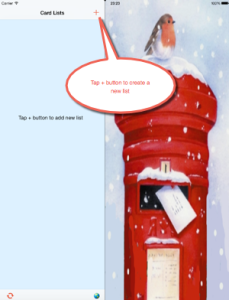 You can tap the Save button to create a Christmas list, or select one of the other list types – General, Thanksgiving or Easter. The Year will default to the current year, but you can change it if desired e.g. you could start preparing the list for next year by selecting the following year. 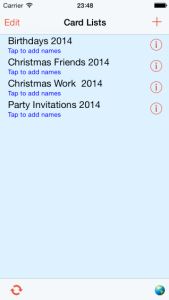 If you tap Save in the example shown, the list would be called Christmas 2013. However, if you would like to call it something else, just tap where it says Change List Type Name if Required, and type the desired name. This can be handy if you want different groups of cards. For example, you might want to create a list for friends, another for family, and another for work colleagues. 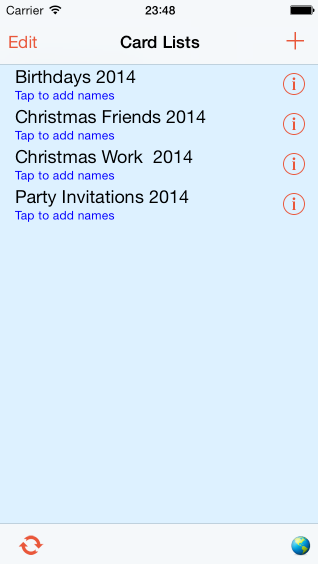 To do so, you could call the list say Christmas Friends, then repeat the process to create Christmas Work. Another use for changing the list type, if to select the General type, and change its name e.g. to Birthdays, Party Invitations etc.